It is a pretty often scene in garbage cans and recycling containers to see an abundance of empty water bottles. A new phenomenen has been showing up in student housing, campus facilities and airports. 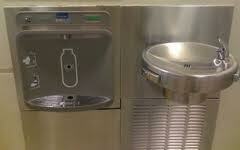 Refill those bottles at stations dedicated for that purpose. A lot of us do remember when drinking water came from a faucet, its time to go back!